The credit ratings agency Moody's has downgraded France from its top rating. The country's debt has been reduced from AAA to AA1 and has kept its negative outlook, meaning it could be downgraded again. In a statement, Moody's blamed the risk of a Greek exit from the euro, stalled economic growth and the chances that France will have to contribute to bailing out other countries. Rival agency Standard & Poor's downgraded France in January. Moody's said the primary reason for the downgrade had been France's "persistent structural economic challenges" and the threats they pose to economic growth and the government's coffers. "These include the rigidities in labour and services markets, and low levels of innovation, which continue to drive France's gradual but sustained loss of competitiveness and the gradual erosion of its export-oriented industrial base," Moody's said. 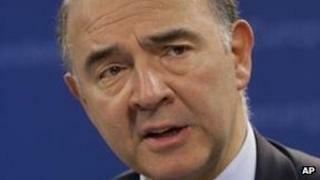 French finance minister Pierre Moscovici said the downgrade was motivation to pursue structural reforms. He also blamed the downgrade on the economic management of previous governments and added that France was still committed to cutting its public deficit to 3% of output next year.